WHITE is a basic color for spring and summer wardrobes, along with CREAM. While black is year-round, the lighter neutrals are reserved for warmer weather and sunshine. Accessorize with jewelry and handbags in white or cream with our selection on this page! White and Cream are also traditional bridal accessories, too! Rich with color of glasslike jeweler's resin, this bangle has oval shape, hardware in gold vermeil (18kt gold over sterling). Hinged for easy on-off (hinge stays under wrist), and magnets in the ends help keep it closed. Measures 2-3/8 inches across, 1-3/4 inches deep, for small to medium wrist. 1/2 inch wide and rounded top surface. The color is opaque bright white. Twisting lifesaver links are intertwined into a lightweight classic earring. Glasslike jeweler's resin forms two of the loops, at center is a gold vermeil one (18kt gold on sterling). 1-7/8 inches long, 7/8 inch across, a surgical post is located at the very top. The color is opaque bright white. Graceful tapered column of colored porcelain measures about 7/16 inch across, topped with a 24kt platinum edging, finishing with a white pearl bead. This shape is half of a round column that is slightly wider at the top. Suspended below sterling silver french earwire, 1-7/8 inches long overall. Straw pattern is beautiful natural ivory and golden caramel colors with thin ribbons of black and ivory veins. 15 ounce clear wine glass stands 9 inches tall. We have a gal in blue dress, another in yellow, obviously preggers in style! Words Labor of Love, balloons it's a girl and it's a boy, baby's t-shirt, buggy, favorite pregnant food, stork and hearts. 1-1/2 inches long including sterling earwires, 3/4 inch across. Teardrop convex metal shape, lightweight, glimmering white backing. The artwork depicts black and brown tree camouflage on white background. 2 inches long including goldfill earwire, 1 inches across including natural twig. A circle of handmade paper is colored ivory with black swirls, a larger curving black swirl spans the notch on top. White pearl accents, suspended from natural twig by golden straps. 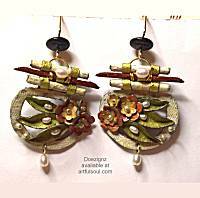 Colorful beads are securely mounted to comfortable and flexible silver fabric backing, the pattern is created with colors of cream, ivory and amber, with silver beaded ribbon borders. Bracelet measures about 1-1/2 inches wide, 7-1/8 inches long when closed by foldover style clasp. It can be worn snugly. The figure-8 shape is defined by tiny beads mounted securely onto silver fabric backing. Larger cream color pieces at the center are surrounded by cream, amber and silver colors. About 2-1/2 inches long including the elongated and gracefully shaped silver plated earwires, 7/8 inch across. Colorful beads are securely mounted to comfortable and flexible silver fabric backing, the pattern is created with colors of cream and ivory, with silver beaded ribbon borders. 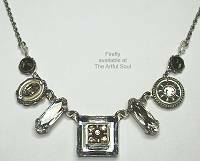 Bracelet measures about 2 inches wide, 7-1/4 inches long when closed by foldover style clasp. It can be worn snugly. Exotic neckpiece has creamy ivory and amber color beads with clear crystals worked into ornate design that curves about 8 inches across front, 2 inches wide at the center. The beads are secured to lemon yellow backing, and all is suspended from silver metal beaded ribbon that is flexible and closes at about 18 inches long with tongue-in-slot clasp. 2 inch pendant in flower motif has colorful beads and silver metal bead ribbon secured to flexible silver fabric backing. The colors include cream, ivory and amber. Suspended from skinny silver metal bead ribbon with tongue-in-slot clasp, 16 inches long. 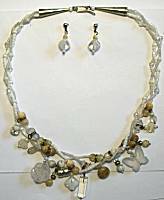 Crystals and mosaics of beads span front 3-1/2 inches of necklace, centerpiece is 1/2 inch square. Finished length on steel chain adjusts 16-17 inches. Sparkling clear and cool silver colors for icy elegance. 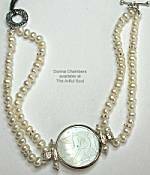 5/8 inch round pendant, suspended from steel chain that adjusts 16-18 inches. Silver rope-style frame holds tiny clear glass beads and the central clear crystal for icy elegance.